After the massive success of the ultra-affordable Xiaomi Mi Band 2, today the company introduced its successor, predictably called Mi Band 3. It keeps all key features like counting steps and measuring heart rate, and will also offer the ability to answer calls. The Mi Band 3 has a 0.78” OLED panel with 128 x 80 pixel resolution. It connects to devices through Bluetooth 4.2 and sports a 110 mAh battery, which is 50% increase over the Mi Band 2. 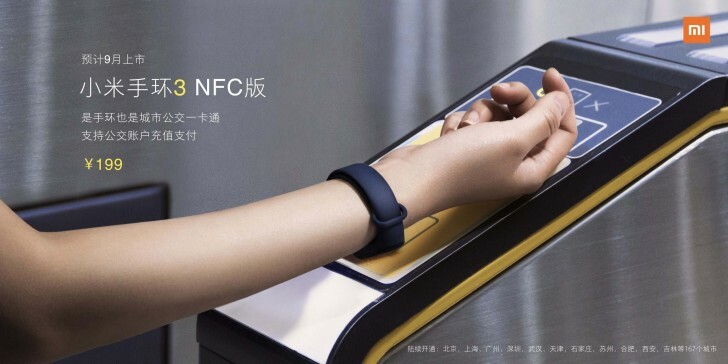 The fitness tracker has a version with NFC chip, meaning you’ll be able to pay wirelessly. Xiaomi promises 20 days of battery life and looking at how the company kept its promise with the Mi Band 2, the new one is most likely to follow through. It will have interchangeable straps in various colors and will be available on Tuesday, June 5. The price is CNY169 ($26/€22), while the NFC variant is CNY199 or $31/€26. Most probably you are using the full functions of the band 3, like the heart sensor is always on for example, that drains the power way faster than usual. why my Mi Band 3 cant even keep up in 3days and the battery already drained?